Hello everybody. By request, I have rounded up a diverse array of gluten-free Passover recipes from all over the internet. As you can see from this collection, it is definitely possible to have a delicious and kosher seder free from gluten! None of these recipe include gluten-containing grains (wheat, most oats, rye, barley, kamut, spelt, triticale and their derivatives) and most are also considered non-gebrokts. I've organized this list into categories of foods commonly eaten during the Passover week, especially during the seder. I hope this will help give you some ideas of foods to prepare next week. Feel free to post additional links in the comments! Please note: I haven't gone over all of these with a fine-tooth comb so please double-check to make sure they meet all your dietary requirements. Not all communities or individuals observe the same rules for Passover kashrut. 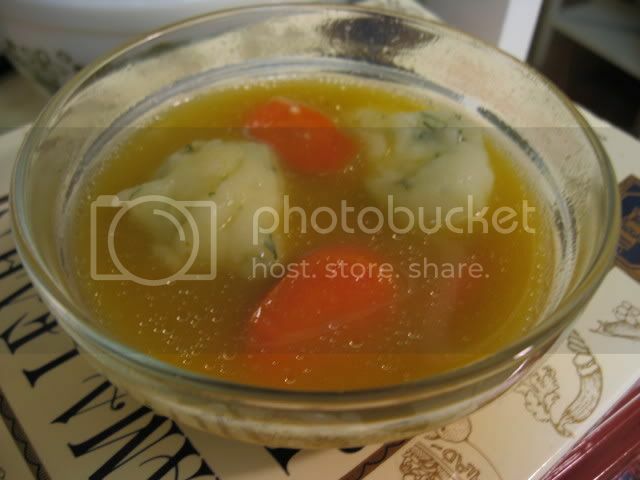 Most of these recipes adhere to Ashkenazi kashrut, which holds that not only chametz must be avoided, but also kitniyot. 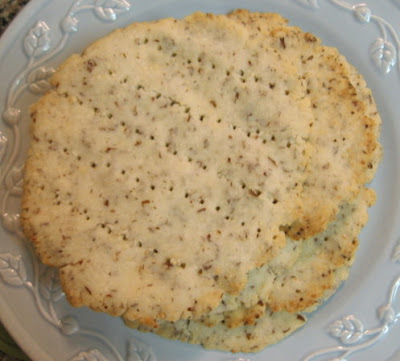 A few of the recipes do contain kitniyot, so they are suitable only for people who follow Sephardic Pesach kashrut. Use your own judgment, and if you have questions please consult your rabbi. Chag sameach! Have a wonderful Passover. Noodle kugels generally aren't associated with Passover, since most noodles aren't kosher for this holiday. 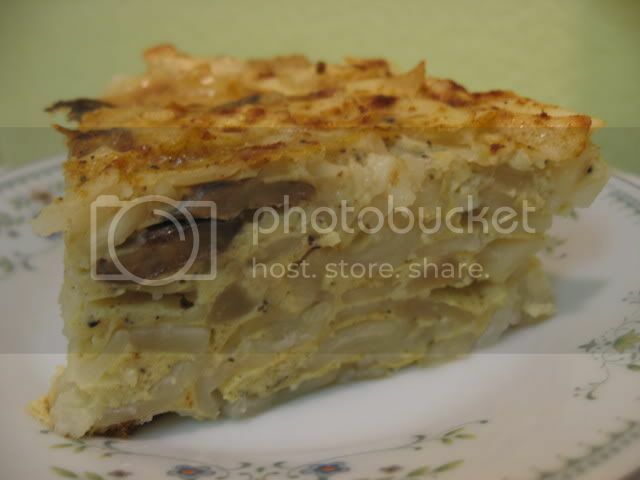 Instead we usually focus on potato and vegetable kugels, and save the noodle kugel for the rest of the year. 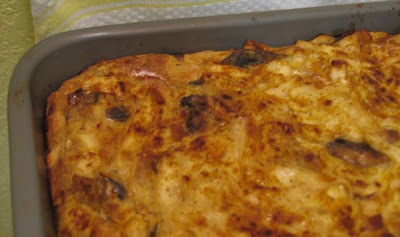 When I saw that the company I was ordering Passover supplies from carried Manischewitz Passover Gold Wide Egg Noodles, which are kosher for Passover and made from potato starch, I got an idea... A gluten-free Passover noodle kugel! I'd heard lots about these non-gebrokts gluten-free egg noodles. They are sold only in the weeks preceding Pesach, and cannot be obtained during the rest of the year. I ordered 5 bags of them without having ever tasted them, just to make sure I had enough to last me for a couple of kugels... And I'm glad that I did. I hear that Gefen and Flaum also make their own Passover egg noodles, and Frankel's makes a frozen version. Try your local kosher grocery. If you can't find them, you can try making your own. If you're not kosher for Passover or you follow Sephardic kashrut, you can try almost any other brand of wide, flat gluten-free noodle. I imagine that gluten-free tagliatelle or lasagna noodles (cut in strips after cooking) will work, though the texture won't be quite the same. I based this recipe off of suggestions from my dad, savory kugel recipes online, and a sweet noodle kugel recipe from Mama Leah's Jewish Kitchen (by Lisa Loeb Fischer). Mama Leah, a friend of my family, used to run a chain of Jewish take-out shops in New York City. Her book never lets me down. 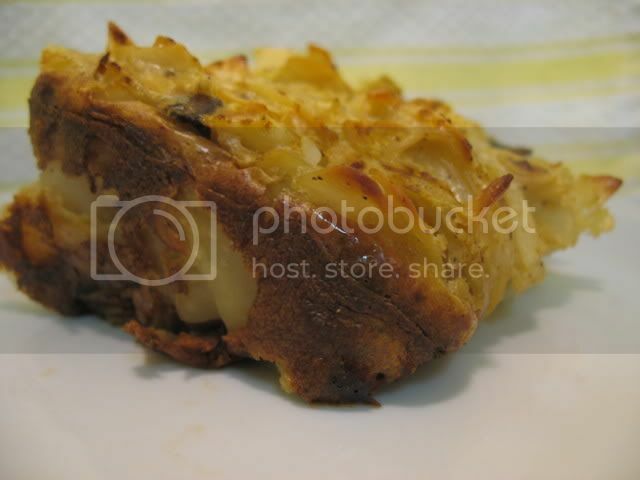 The result was wonderful - This kugel is peppery, filling, and full of flavor. It gets crisp around the edges but stays moist within, and it reheats quite well in the oven or microwave. Preheat oven to 350 F. Bring a large pot of lightly salted water to a boil. Add noodles and boil until tender (Manischewitz Passover Egg Noodles take about 4 minutes, but time may vary depending on brand). Drain the noodles immediately. Be very careful to not overcook them, they should not be mushy. In a heavy saucepan, heat butter or vegetable oil on medium heat and sautee onions and 1 teaspoon of sugar until brown and beginning to caramelize. Add garlic and mushrooms and cook until mushrooms are tender. Remove from heat. Beat eggs in a large bowl, then add milk, sour cream or cream cheese, cottage cheese, 1 tablespoon of sugar, 1 teaspoon salt, and ground black pepper. Mix together using a standing mixer, wooden spoon, or electric hand mixer, until combined (some lumps of cheese may remain). Add the noodles and onion-mushroom mixture and stir well to combine all ingredients. Pour into a buttered 10x14 inch baking pan, and sprinkle lightly with paprika. Bake for 1 hour or until the eggs have set and the entire kugel is firm. The edges and top should be slightly browned. Allow to cool for at least 15 minutes before serving. Serve warm or at room temperature. In yesterday's Potato Kneidlach post I mentioned that I would share with you another use for leftover batter from those fabulous potato dumplings. Here are the photos I promised. 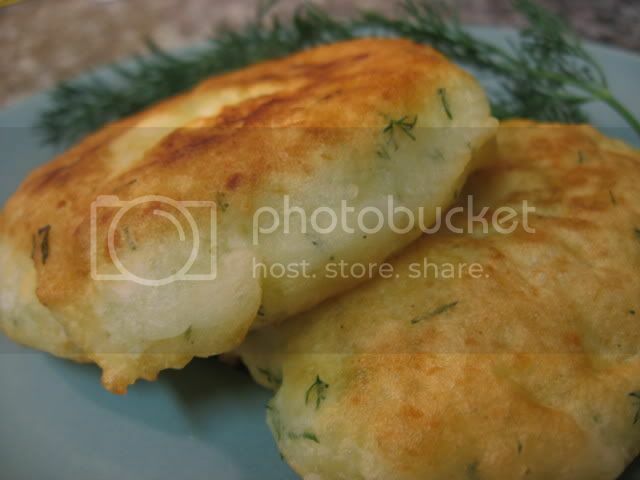 The kneidlach batter makes delicious and unusual gluten-free potato pancakes - They are not latkes, but rather are pancakes with a very chewy, somewhat cakey texture and a crispy exterior. If you enjoy the chewy sweet rice flour pancakes of some Southeast Asian cuisines, you will definitely enjoy these. I enjoyed these plain for breakfast two days in a row. They taste good alone, or try melting cheese over them, or serving them with ketchup or lemon-butter. They'd also be a good accompaniment to a meat dish or vegetable stew. I've written all the ingredients out below- If you have already made the batter for the potato kneidlach, simply use that for the pancakes. The only other ingredient you need is the 2 additional tablespoons of oil for frying. 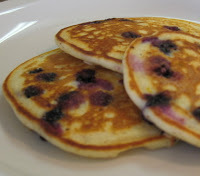 However, if you are making this recipe for the pancakes alone, you will see that I have reduced the quantity of potato starch in this recipe (as compared to the potato kneidlach recipe) because I think that will improve the texture. Feel free to leave the dill and pepper out of the recipe for wonderful sweet gluten-free Passover breakfast pancakes that could be served with syrup, fruit or jam. Cut potatoes into large chunks and boil in water until soft. Drain and allow to cool. Once cool, mash with 2 Tbsp of oil, eggs, salt, pepper and dill. 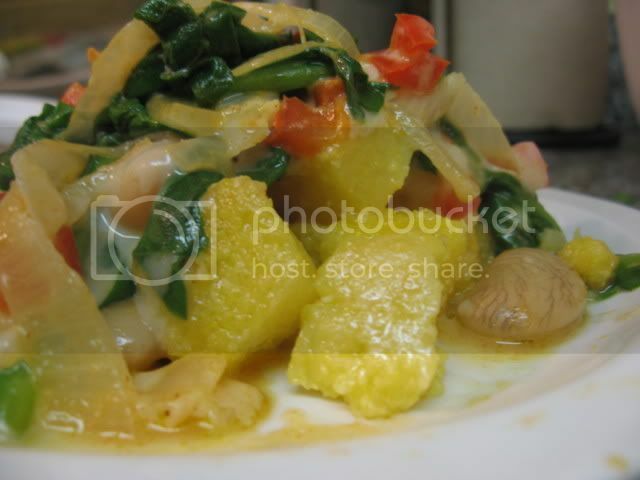 Stir in potato starch until thoroughly combined, and refrigerate the mixture for 1 hour. Heat oil in a heavy non-stick pan over medium-high heat until shimmering. Place 1/4 cup of batter at a time into the hot oil, using the back of a spatula to press flat until each pancake is no more than 1/4 to 1/3" thick. Cook until golden-brown on each side (2-3 minutes per side), flipping once. Place on a plate lined with paper towel to absorb excess oil. Serve while hot. Potato kneidlach are light, fluffy potato dumplings for Passover that are a wonderful gluten-free substitute for matzo balls. I have loved these ever since I first made them for a gluten-free friend in 2005. I based this recipe off of one from The Passover Gourmet by Nira Rousso. 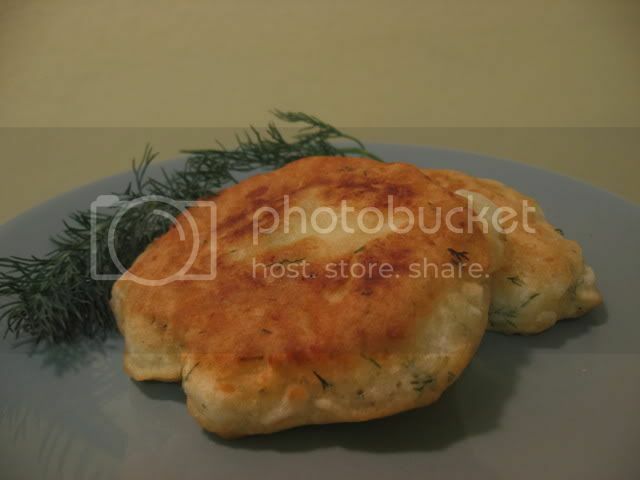 My dad e-mailed me Rousso's recipe for potato dumplings a few years ago and I used that as the basis for these. This afternoon or tomorrow I will post about another delicious use for leftover potato kneidlach batter. Cut potatoes into large chunks and boil in water until soft. Drain and allow to cool. Once cool, mash with oil, eggs, salt, pepper and dill. Stir in potato starch until thoroughly combined, and refrigerate the mixture for 1 hour. Bring soup or a pot of lightly salted water to a boil. Use your hands to gently form rough ball shapes from one tablespoon of batter at a time, and submerge dumplings in the soup or water - If you prefer, you may use a soup spoon or ice cream scoop to move free-form spoonfuls of batter into the pot. 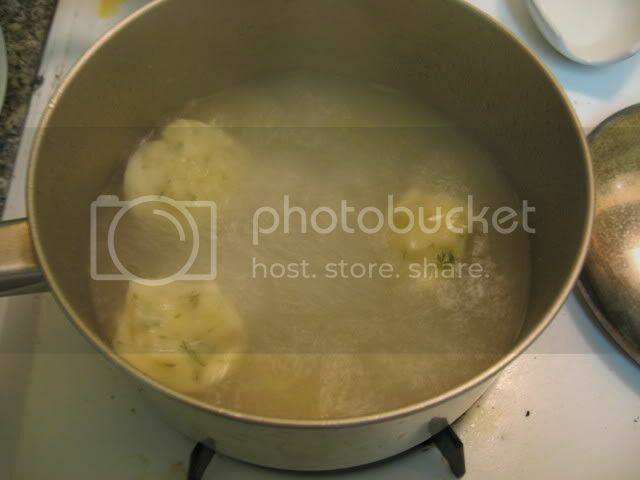 Boil for approximately 5-6 minutes - The dumplings will float up to the surface quickly but will need several additional minutes to cook all the way through. Serve in soup, or as a side dish with butter or margarine and fried onions. 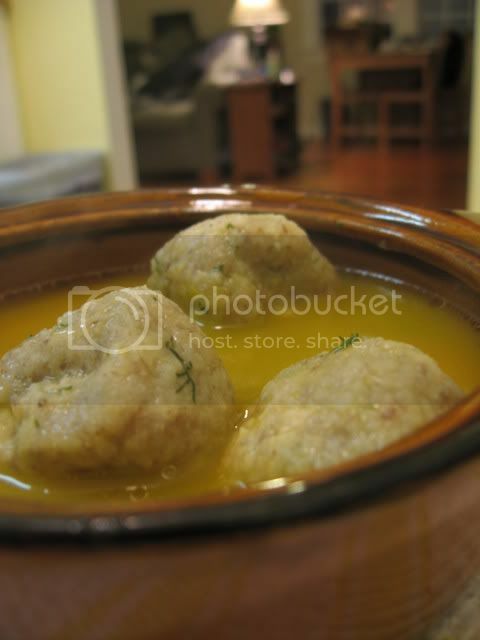 You knew I wasn't going to let this week go by without posting a gluten-free matzo ball recipe, right? Matza balls, matzah balls, matzo balls, kneidlach, knaidlach, knaidls.... However you choose to spell it, these tasty dumplings are the culinary focal point of the Passover seder for many Jews, myself included. Good gluten-free matzo balls are elusive - Most of the recipes I found online featured ingredients that are definitely not kosher for Passover, or that were far too obscure to be practical. While nothing will ever be quite as delicious as the "real thing", these gluten-free kneidlach come closer to capturing the texture I was looking for than any other recipe I've tried. I can't see myself eating 5 of them (which is my usual matzo ball quota, when I can get away with it), but I definitely enjoyed two of them floating in my soup last night. The texture was closer to what I was hoping for than I'd imagined possible. Choose a very finely ground blanched almond meal for the best texure. If you aren't vegetarian, you'll find it well worth using chicken fat (such as the fat that you skim off the top of the chicken soup, allowed to cool and solidify) instead of oil. There are three kinds of matzo balls, in my family's lexicon: "Clouds" are light and fluffy all the way through; "cannonballs" are dense and firm throughout; and then there are "Dad's matzo balls" a/k/a The Perfect Matzo Balls, which are firm and dense within but have a fluffier layer around the outside. Dad's matzo balls are preferable to me, followed by cannonballs. These gluten-free matzo balls undoubtedly fall into the cannonball category. If you'd like to try to get them lighter, I'd recommend whipping the egg whites into stiff peaks and gently folding them into the batter at the last minute. A note about flax seeds: These are considered kosher for Passover by some, and kitniyot by others. If you use them, be sure to use finely ground flax meal. If you consider flax seed to be kitniyot, try omitting this ingredient. Since many of you will be making these only for one or two family members with celiac disease or gluten intolerance, this recipe is for a small batch - It will make enough kneidlach to serve 2-3 people. Beat egg with salt and pepper. Add remaining ingredients, and combine well. Refrigerate for 1 hour. Add additional potato starch, if necessary, until the batter is firm enough to be rolled into balls with your hands - It will still be sticky, but not too wet to handle. Using clean, dry hands roll a tablespoon of dough at a time into balls. Submerge in boiling water or soup. Allow to cook for approximately 10 minutes or until each ball has puffed up a bit and is cooked all the way through. I "auditioned" a dish for Passover this week... The recipe is from user Annacia on RecipeZaar, with minor gluten-free adjustments. I offered to review the recipe for her, thinking it might work if I had a vegetarian seder. It looks like I won't be having a vegetarian seder, but this dish is a sure winner. It might just be my new favorite potato dish, second only to kugel. It is so decadent and flavorful, and reheats very well in the oven or microwave. I have to admit I was tempted to add a lot more cheese than the recipe calls for- And ultimately, I did add a bit more to the top of the casserole at the end, and then stuck it under the broiler for 30 seconds. I like to think I made up for this by using 2% milk instead of whole, but I suppose it doesn't work that way. Oh, well. It sure was good. Don't use American-style gruyere if you can help it - make sure to find a gruyere that is Swiss, otherwise use fontina or emmenthal or another good melting cheese with a little bit of bite to it. To make a gluten-free roux for this dish I used arrowroot flour, a fine powder which works wonderfully as a flour substitute in gravies and cream sauces. You can try using other thickeners, but stay away from gluten-free flour mixes that contain nuts or other darker or coarser particles (for example, Pamela's Baking and Pancake Mix) as you will not achieve the smooth, white consistency you are going for with a white sauce. Cornstarch is not recommended since it becomes gummy when the dish cools or is refrigerated. I've had good luck with both Asian sweet rice flour (also called sticky rice flour or glutinous rice flour) and arrowroot, which are both finely ground and white in color. For Passover, I would try using heavy cream instead of 2% milk, and using potato starch as a thickener (adjust the quantities as necessary). This is a terrific way to use one of my favorite new ingredients, walnut oil. It is well worth seeking out walnut oil for this recipe, because it has such a beautiful flavor. Trader Joe's is now carrying it, which means it's sure to become a staple in many kitchens within the blink of an eye. It looks like Gefen and Nutola both make kosher l'pesach walnut oil. This dish also shows off the complexity of fresh sage in a way that is lovely. 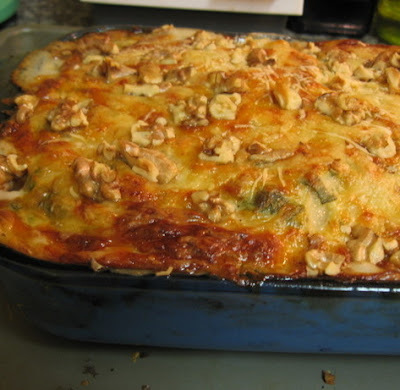 The sage, walnuts, and walnut oil work together to make this a more sophisticated and less pedestrian gratin. Thanks, Annacia! Peel potatoes and thinly slice. Use a knife or the thin slicing blade on the food processor. Slices should be no thicker than 1/4." Place slices in a bowl, submered in cold water to keep from browning. In a medium saucepan on medium to medium-high heat, cook the onion and garlic in walnut oil until tender but not browned. Stir in flour, salt, and pepper, then quickly add all of the milk. Cook over medium heat, stirring constantly with a whisk until thickened and bubbly. Remove from heat; stir in snipped sage. Grease a 2-quart round casserole (with glass cover) or a deep 2-quart baking dish. Layer half of the potatoes in casserole. Cover with half the sauce. Sprinkle with half the cheese. Repeat layering with the potatoes and sauce. Cover with lid or tented tinfoil. Bake uncovered at 350 F for 40 minutes, then uncover and bake 25-40 minutes more or until potatoes are tender. 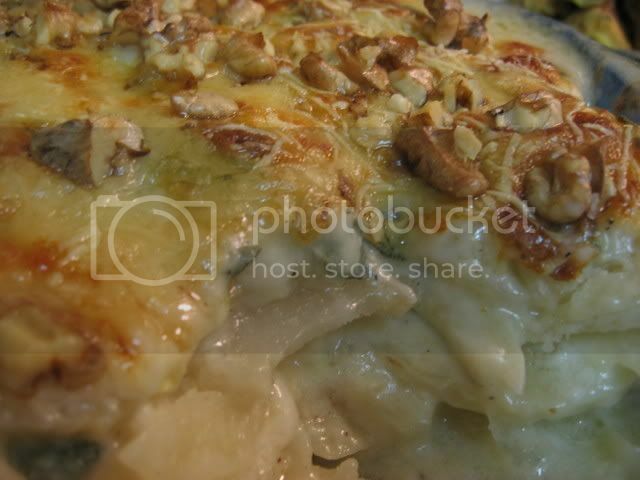 Sprinkle remaining cheese and all of the chopped walnuts over top. Bake, uncovered, 5 minutes or until cheese is melted and bubbly. Let stand 10 minutes before serving. Garnish with remaining sage leaves. Welcome to the first springtime installment of my sorta-kinda regular recipe roundup, folks. I've corraled an incredible slew of gluten-free recipes from across the blogiverse for you. For those who haven't already discovered this, all of the Semi-Weekly Gluten-Free Recipe Roundups can be found here. 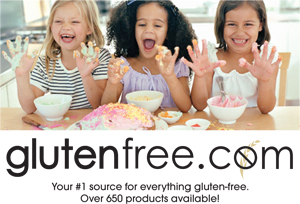 Or just look for the label "Gluten-Free Recipe Roundups" in the category list in the sidebar to see all of the past posts that are labelled as roundups. This week's collection includes a family kolache recipe adapted to be gluten-free, salads for the increasingly warm weather, not one but two recipes for gluten-free Irish soda bread, and hand-made gluten-free ravioli. Bon appetit! "What is that delicate looking pastry in the photo?" you are wondering. 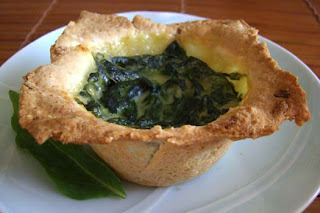 That is nothing other than a Chebe Garlic Spinach Tartlets, one of the lastest creations of Seamaiden, the author of the new gluten-free blog Book of Yum. Seamaiden is truly the Queen of Chebe, using the tapioca bread mixes to craft all kinds of delicious baked goods both sweet and savory. In the list below you will see another recipe of hers, a gluten-free recrafting of the okonomiyaki pancake, which she discovered while living in Japan. Black Genoa Figs with Buffalo Mozzarella "a la Pearl"
As always, some of these recipes may include ingredients that are available in both gluten-free and non-gluten-free versions, so be sure to carefully read all product labels. This blog accepts no responsibility for over-stuffed tummies, drooling mouths, or burnt tongues. By request, I have created two options for comment feeds for this blog - So when you leave me a comment (such as "where can I find nutritional yeast?" or "what can I substitute for amaranth flour?") you won't miss my response. This is also a great way to stay on top of what other fabulous readers are saying or asking about my recipes. I hope that the comments being more accessible and interactive will help foster conversation and community. To subscribe to have all the comments to every single post on this blog e-mailed to you or visible on your feed reader as they are posted, all you need to do is click here and follow the instructions. There is also a link to the comment feed on the left sidebar. If you wish to subscribe only to the comments for specific posts you have particular interest in (such as any post that you commented on, so that you can read what others have to say to you) but don't wish to read all comments to all other posts, this option is for you. You will find a link to this feed if you click on the title of a post to open that post up. Scroll down to the bottom of the comments. The link you're looking for says "Subscribe to: Post Comments". It will bring you to a page with all kinds of code on it. You will need to cut and paste the URL of this page into the appropriate area of your feed reader or other RSS service. The vast majority of you read this blog via e-mail and I'd assume you probably read the rest of your favorite blogs that way, too. Others of you visit this blog directly on a regular basis. So once again, I have to put a plug in for Google Reader as one of the best and easiest ways to read all of your favorite blogs on one single page. You will never miss a post, and you don't even have to clog up your e-mail inbox! I subscribe to hundreds of blogs, all of which I read in one place when I log onto my Google Reader page each morning. It is one of the most wonderful internet innovations and I love not having to remember which websites I need to visit every day. The only thing more comforting than a warm slice of home-baked bread, fresh from the oven? A warm slice of home-baked bread, fresh from the oven, that is infused with rosemary and olive oil and speckled throughout with kalamata olives! 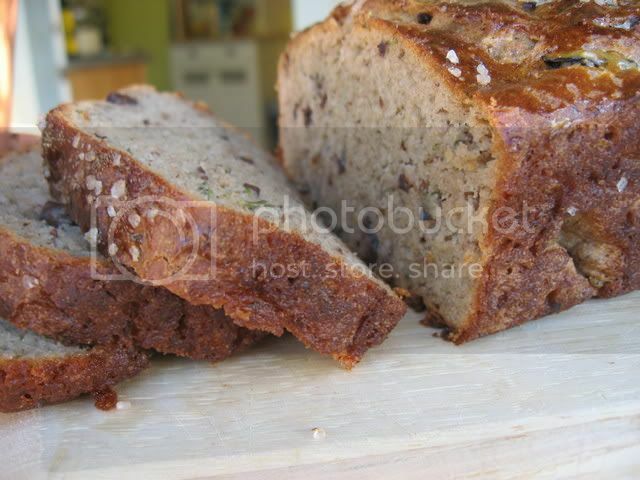 I have been craving a hearty, rustic-style olive bread. Though this recipe did not turn out to be anywhere near as crusty or rustic as the loaves I enjoyed in my gluten-eating artisan-bread-buying days, it certainly turned out wonderfully flavorful. It has the soft, pliable, no-toasting-necessary sandwich bread texture of the Gluten-Free Multigrain Miracle Bread I posted about a few weeks ago, but with a palette of complimentary, savory flavors. Judging by the looks on the faces of the gluten eaters I fed the olive-rosemary bread to, this recipe is a success. Try this bread with butter on it, or as an accompaniment to Southern European and Mediterranean dishes, or try it with any soup or stew. As for me, I ate the entire loaf (not at once, of course) with hummus on top because I loved how the flavors went together. It would also make a killer grilled cheese sandwich with sharp cheddar. 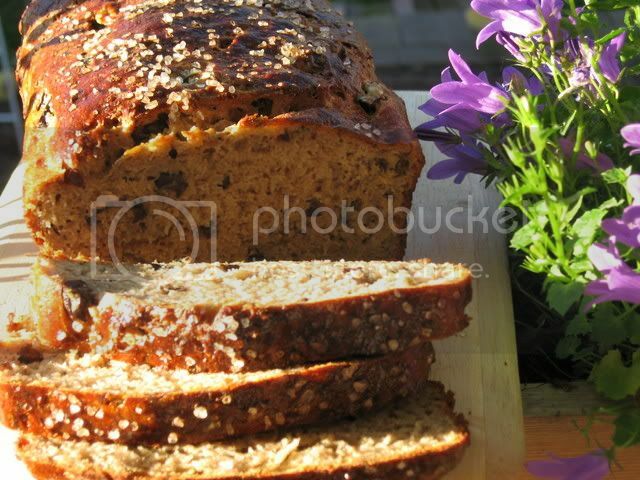 1) Do you have any gluten-free bread recipes that yield a "rustic" loaf with a thick or chewy crust? 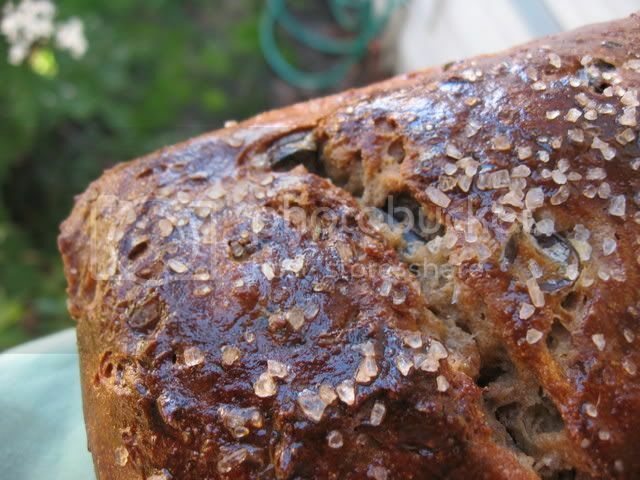 2) What makes a bread rustic, anyway? Sift the flours, yeast and all other dry ingredients (except coarse sea salt) into a medium bowl. Stir in flax meal and rosemary, and combine. Combine wet ingredients, including the two whole eggs and the two separated egg whites in a large bowl, using a hand-mixer on low or medium speed. 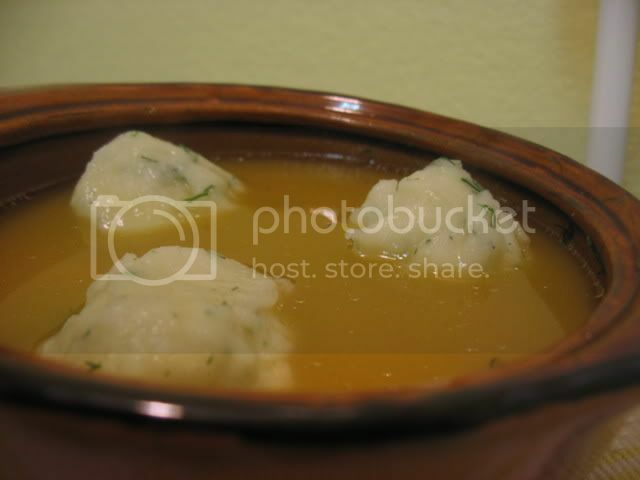 [The two separated egg yolks should be set aside in a small bowl for later use as a glaze]. When fully combined, add kalamata olives. Slowly add dry ingredient mixture and mix with a wooden spoon until fully blended, with no lumps. Scrape the sides regularly. Grease a 9x5" bread pan, and pour the dough into the pan. Use a spatula or knife to evenly shape the top of the loaf. Cut two diagonal slashes in the top of the loaf. Beat the two separated egg yolks that have been set aside and brush the top of the loaf very lightly with them. Optional: Sprinkle coarse sea salt crystals very sparsely to embellish the loaf. Turn off the oven and immediately place the pan in it. Do not open the door again, if possible. Allow the dough to rise for 90 minutes. It should rise to the very top of the pan. Increase heat to 350F and bake for approximately 40 minutes. The crust should be golden-brown. Allow to cool slightly before removing it from the pan to finish cooling. Do not slice until the bread is no longer hot. This loaf does not need to be frozen, but if there are leftovers after a few days, place slices in airtight bags and freeze. More gluten-free baked goods will be finding their way to this blog in the coming days, but in the meantime it's back to vegetables. It's amazing how the simplest dishes are so often the most successful. 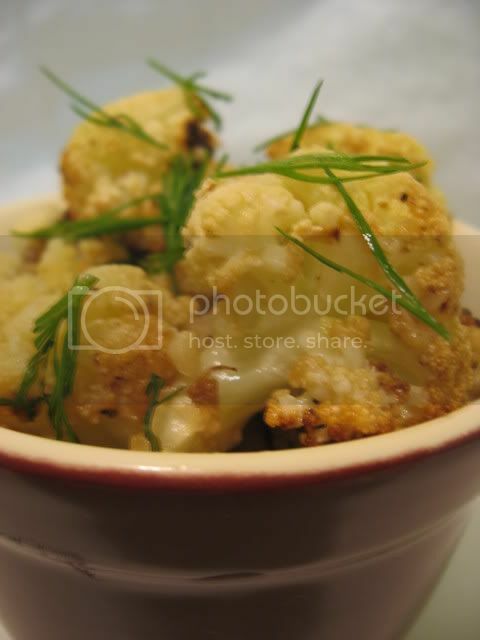 Roasted cauliflower, with a few added ingredients: Bam! Flavor explosion! I love the way the sweetness and tartness of the lemon juice play off of the caramalized and browned edges of the cauliflower. 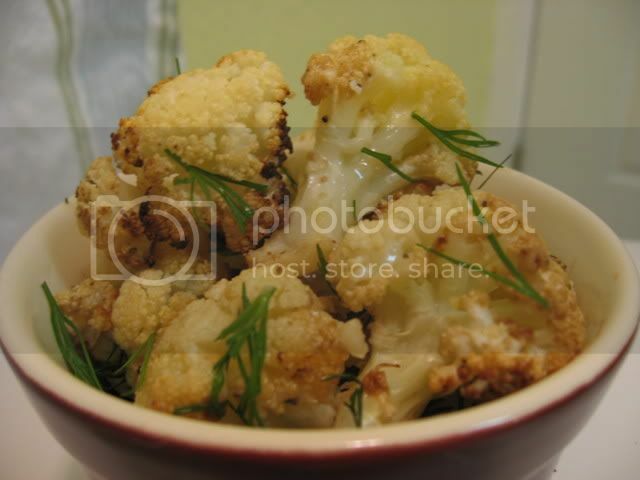 This dish is easy, requiring very little preparation, and I have a feeling that even cauliflower skeptics will enjoy it. Karina wrote this week about her on-again off-again vegetarianism. For reasons ranging from religion (kosher dietary laws make vegetarianism an easier choice) to ethics and environmental concerns, my own diet has become mostly vegetarian. I have no ethical opposition to eating meat - Just concern about eating meat that I can't guarantee came from happy, healthy animals who had access to sunlight and pasture and whose raising didn't have a massive negative environmental impact. Finding grassfed beef that's also kosher here in the Bay Area? Fuggedaboutit! There's also the fact that I am the World's Biggest Vegetable Fan (tm). My appreciation for fresh produce has really grown since becoming gluten-free. I could live on vegetables for breakfast, lunch and dinner - Which one day I realized isn't really such a bad idea from a health perspective. So my meals revolve around vegetables - And beans, whole grains, nuts, eggs and goat cheese (yes, goat cheese is in a category of its own). With fish once or twice a week, almost no chicken, and organic beef once a month or so - at that particular time of the month when my body screams out for iron. So back to cauliflower... It's low-glycemic index and low-carb, which is part of why it's so popular in recipes for diabetics and South Beach followers. It roasts wonderfully, and lends itself to mashes, gratins, latkes and other recipes that would normally use nutritionally-empty white potatoes. The flavor from the fresh dill is really wonderful in this dish, which can be eaten at hot, at room temperature, or on top of a salad. I found it so snackable that very little ended up making it to the tupperware I had laid out for it. Preheat oven to 400 F. Place cauliflower florets in a large bowl. In a smaller bowl, combine all ingredients except for cauliflower, whisking until blended. Pour marinade over the cauliflower and toss until coated. Spread on baking sheet. Drizzle any remaining marinade over the cauliflower. Bake for 30-45 minutes or until tender but not mushy. Toss once, if desired, halfway through cooking. The cauliflower should have some browning around the edges. This is a delicious winter fruit salad recipe from Mirj, who is possibly the most prolific kosher cook on RecipeZaar. Some of you will remember the beef tzimmes I posted last week, which was based on a recipe of hers. Her recipes have yet to fail me - This fruit salad was no exception. It makes use of the fruits that are widely available in supermarkets this time of year, which is a good reminder for me that no matter how much I might be craving apples or strawberries, March just isn't the time to buy them. I have adapted the recipe slightly to suit my tastes and my dietary restrictions as well as to cut the amount in half, since I'm not feeding a family of 10 like Mirj is (yet)! I wrote her to let her know that this is the first time I have ever enjoyed figs, which is quite an achievement. I have put in parentheses my silly little nickname for this dish - I've been calling it "tropical charoset", because I believe it would make a wonderful charoset alternative for Passover. Peel and segment 5 of the 6 naval oranges; remove all membrane and chop roughly. Peel the tangerines or celementines, segment, and add to bowl with naval orange pieces. Chop figs in very small pieces and slice bananas. Add to the rest of the fruit. Squeeze the juice from the remaining naval orange over the fruit, and toss. 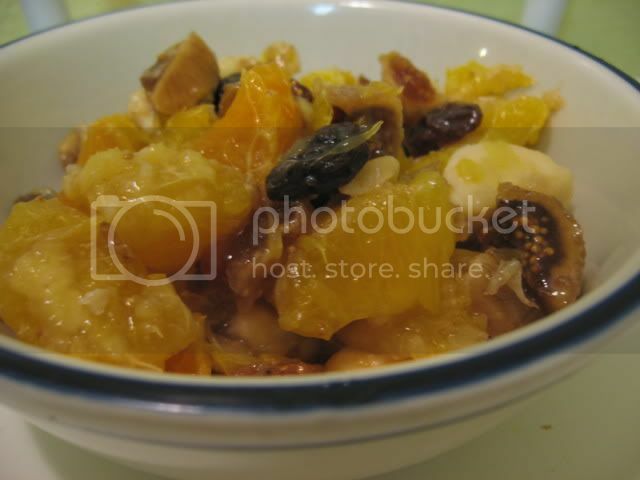 Stir in raisins, walnuts and wine or juice. Serve cold or at room temperature. This dish looks best when served immediately, but tastes wonderful the following day. Spanish cooking seems to be sweeping the United States these days. Tapas joints, pimenton, sherry vinegar... I'm digging this trend. There are so many traditionally gluten-free dishes in the Spanish culinary repertoire, and I love the flavors it has introduced into my cooking. I've been looking forward to trying this recipe because I've always loved paella but it's loaded with shellfish, which are not kosher. It's hard to go wrong with vegetables, rice, and spices - And this dish, which I doctored with my own mix of spices, certainly didn't let me down. 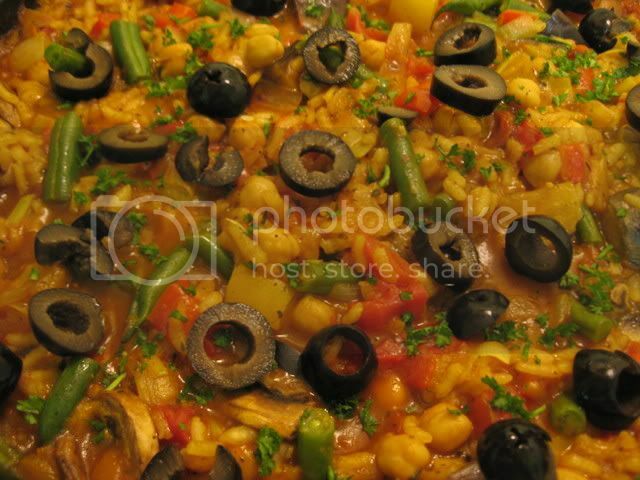 This beautiful vegetarian paella, with its vivid spectrum of vegetables, is a flavorful and colorful one-dish meal. The texture and combination of tastes are excellent, and didn't leave me missing the meat. OK, I'll admit it, I served it as a side dish for tuna steaks - But I promise it can hold its own as a vegan/vegetarian main dish! I used the technique in this article to create a socarrat, the crusty layer of browned, caramelized rice at the bottom of the pan which adds a certain je ne sais quois to paella. This is why the recipe instructs you to turn the heat up at the end of the cooking process. Do take the time to do this - You won't be disappointed. The wider your pan is, the thinner the layer of rice will be and the more flavorful, chewy socarrat you will be able to create. Keeping the rice al dente was a good move - I think leftovers will reheat perfectly. Next time I will try replacing a little bit of the broth with white wine, which I think would add depth to the flavor. I might also try adding marinated artichoke hearts with the other vegetables. Neither of these changes are necessary, but they will give this dish a little more oomph. I look forward to eating leftover paella for lunch at work all week. Kosher, vegan, gluten-free... But most importantly, delicious. 3/10/10 UPDATE: I made this dish again, this time with turmeric instead of saffron. The result was fabulous and quite similar in color, if a little different in taste. If you can't afford saffron or don't have it on hand, eliminate the saffron and instead add 1 tsp turmeric (or to taste) at the point when you add the other spices. Cover saffron with 3 tablespoons of water in a small bowl and set aside. Sprinkle eggplant chunks with salt and allow to sit in a colander for 30 minutes. Rinse and drain the eggplant. Heat the olive oil in a wide, heavy pan. Saute the onion, garlic, cilantro, peppers and eggplant for 5 minutes. Sprinkle with paprika and toss. Then add rice, vegetable stock, tomatoes, saffron (along with the water it's been soaking in), salt, cayenne, paprika, thyme and generous amounts of freshly ground black pepper. Bring to a boil, then lower to a simmer. Cook for 15 minutes, uncovered. Stir frequently. Add the mushrooms, green beans and chickpeas. Cook uncovered, stirring often, for another 15 minutes or until the rice has become tender but is still al dente, and the sauce has thickened. Additional broth, water or white wine may be added as needed during cooking to keep the rice moist. Turn the heat up to high for 5 minutes or until a browned, caramelized crust forms on the bottom side of the rice. 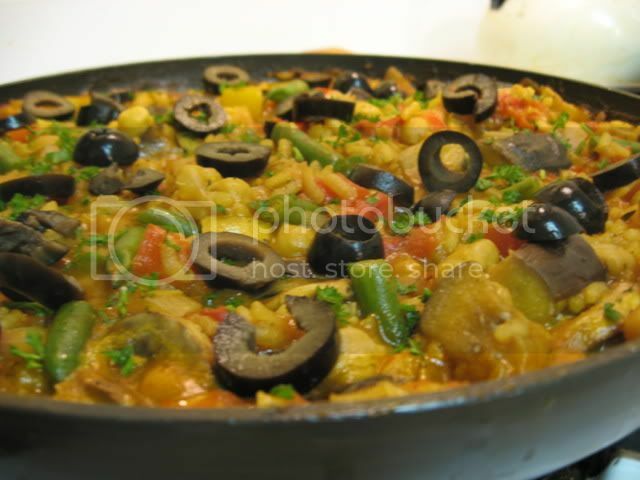 Test for this crust by inserting a fork into the paella and checking for resistance at the bottom. Watch carefully to make sure the rice does not burn. Remove from heat and allow to sit for 5 minutes before garnishing with fresh parsley and olive slices. Serve hot. In Jewish law, only five grains are suitable for making matzo: wheat, barley, spelt, rye and oats. The only one of these grains that can be digested by celiacs and gluten intolerant people is oats, and there are quite a few celiacs who cannot digest oats at all. Even those who can can are only able to eat oats if they were produced in such a way that they were not cross-contaminated with wheat. To make matzo matters more complicated for gluten-free folks, matzah shmura must also be properly supervised during the manufacturing process. Gluten-free shmura matzo, which some rabbis accept as fulfilling the mitzvah of eating matzo at Passover, is available online from Rabbi Kestenbaum's Shemura Oat Matzos. 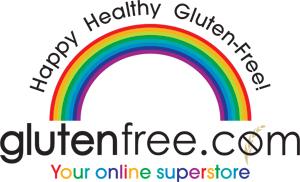 The website lists local vendors in the United States, or you can order them before March 11 from Kosher.com (which also sells gluten-free matzo meal from the same company). There is another option for people who are not as stringent about halacha, or who are looking for a gluten-free matzo replacement for Pesach for a purpose other than saying the matzo blessing... Homemade gluten-free mock matzo! 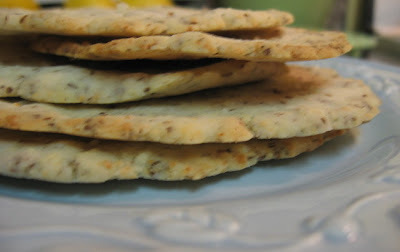 I combined recipes from Living Without Magazine and Celiac.com and was surprised to find that my "matzot" were not only edible - They actually had a pretty nice flavor. I can definitely see myself snacking on these, especially with haroset and maror. While not a deadringer for matzo, they do have a good, crisp texture. They are made of kosher for Passover ingredients, and you can press them out to be just as thin as a mass-produced matzo. You can use pre-ground almond meal as I did, but one recipe I saw recommended using coarser-ground almond meal made at home of unblanched almonds because they found the larger chunks of almond made a good texture. Preheat oven to 450 F. Cover a cookie sheet with aluminum foil. In a medium bowl, combine the dry ingredients. Mix shortening or coconut oil into the dry ingredients using your hands. Add water just a little bit at a time until the dough makes a ball and isn't too sticky. Knead well, making sure there are no big chunks of shortening. If the dough is sticky, add additional potato starch. Take walnut size pieces and press with your fingers onto the foil-covered baking sheet until flat and thin. Smooth out edges, if desired, and use a fork to prick rows of holes. Cook for 10 minutes, watching carefully to make sure they don't get overdone. You should underbake them slightly, rather than overbaking. Remove from oven as soon as the edges become slightly brown - The top should still be white. Oh, what a roundup this week. This has to be one of the biggest and best yet, I am quite impressed by the way the blogosphere keeps churning out impressive gluten-free recipes for us to choose from. 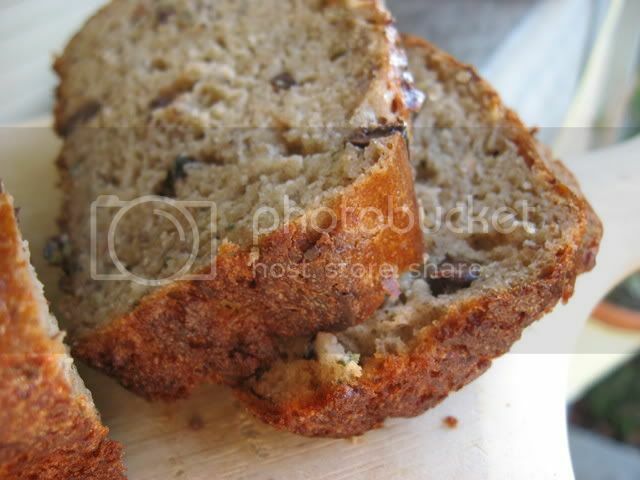 New blogs, old blogs.... Purposefully gluten-free recipes, accidentally gluten-free recipes... It's all here. Here's the cream of the crop. Now what are you waiting for? Get cooking already! 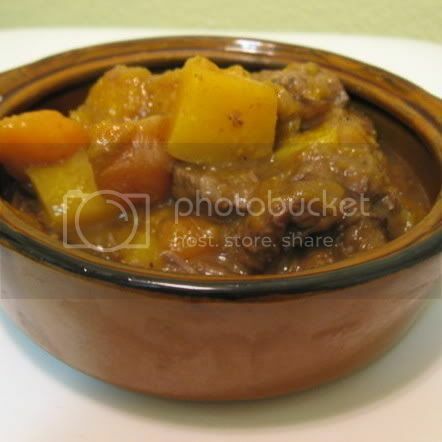 Tzimmes, for the uninitiated, is a sweet, slow-cooked Jewish stew or casserole that usually features root vegetables, honey, cinnamon and prunes but has as many variations as there are Jewish families. Growing up we ate it mostly for Passover or Rosh Hashanah. I've labelled it as a Thanksgiving recipe as well, simply because of the seasonal nature of the ingredients. The word tzimmes is used to refer to "a state of confusion" or "to make a fuss about something" in Yiddish, though from what I've heard it actually originates from the words zum ("to the") and essen ("eating"). Don't quote me on that, I speak only a bissel of Yiddish. Some of you have made and enjoyed my vegetarian tzimmes recipe. Well, here's a delicious twist for the meat lovers out there. Slightly adapted from this recipe, this tzimmes features tender, slow-cooked beef and sweet butternut squash. It makes a wonderful and filling main dish. I love it! Many thanks to Mirj, who shared this recipe and considers it a family favorite. Es gezunterheyt! Cut beef into 1 1/2- 2 inch pieces and pat them dry. Heat 1 tablespoon of oil in a heavy stew pan. Add the beef cubes in 2 batches, browning each lightly on all sides over medium-high heat and removing browned meat with a slotted spoon to a plate. Add remaining oil and heat it. Add onion and saute over medium heat, until brown, stirring often. Return meat to pan, along with any juices on plate. Add carrots, salt, a generous amount of fresh ground pepper, and enough water to just cover the meat and vegetables. Bring to a boil, skimming fat off the top occasionally. Cover and simmer over low heat, stirring occasionally, for 1.5 to 2 hours, or until the beef is tender. Peel the squash and cut it in half lengthwise. Remove seeds from cavity and cut squash into 1" cubes. Add honey, orange juice, cinnamon and squash to the stew, pushing the squash pieces into the liquid. Cover and simmer for 10 to 15 minutes, stirring occasionally. Add prunes and cook for an additional 15 minutes or until squash is tender. Adjust seasoning and serve hot. I love polenta and frequently seek new ways to prepare it, especially recipes that use quick-cooking polenta or the tubes of pre-made ready-to-use polenta that are available at most grocery and natural foods stores in my area. I usually choose Food Merchant brand pre-made polenta since it is verified to be gluten-free. 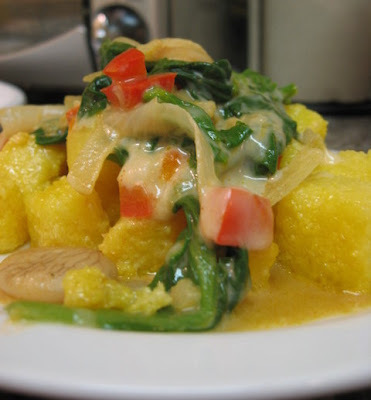 This Spanish-inspired dish is a wonderful new polenta option to add to my repertoire. I adapted it from a recipe that was posted on RecipeZaar. However, a quick web search found that the original source of this recipe is Eating Well Magazine. 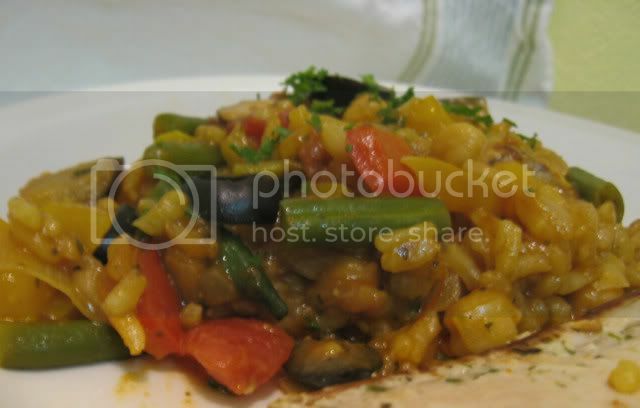 This gorgeous dish is just great - A perfectly balanced vegetarian main dish that is impressively flavorful and satisfying. I used plain paprika, but will try it with Spanish smoked paprika (sweet or spicy) next time. If you can't find butter beans, try replacing the butter beans with cannelini beans - But if you can find butter beans, which are sometimes on the shelf next to lima beans and peas rather than with the beans, they are well worth using for their mild taste and smooth texture. ¡Buen apetito! Heat 1 tablespoon of olive oil in a large nonstick skillet over medium-high heat. Add polenta cubes and cook in a single layer, stirring occasionally, until it begins to brown (approximately 8 to 10 minutes). Transfer to plate or bowl. Reduce the heat to medium, add the remaining 2 teaspoons of olive oil and the minced garlic to the pan, and cook until fragrant - Approximately 30 seconds. Add onion and bell pepper. Sautee just until tender (3-5 minutes). Sprinkle with paprika and stir. Mix in beans, spinach, and broth. Cook until for 3 to 5 minutes, or until the beans are heated through and the spinach has wilted. Stir occasionally. Remove from heat; stir in cheese and vinegar. Serve vegetables over polenta. Optional: Sprinkle with extra paprika.